Spina bifida rachidien et cránien (méningo-encéphalocèle). Description : [2 l. pl. ], 97-102 p. ; ill.: 2 phot., 1 engr. ; 24.5 cm. 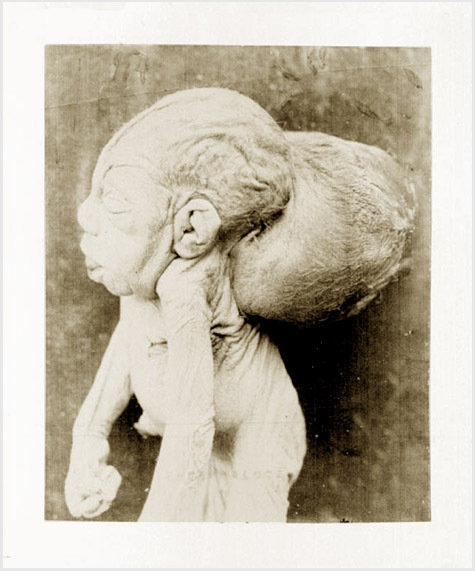 Subject : Skull (fetal) — Meningoencephalocele. Author caption: Par P. Budin, interne des hôpitaux de Paris. Studied under Etienne Stéphane Tarnier (1828–1897). Chef de clinique for Professor Depaul, 1878. Nominated, Professor Agrégé, Faculté de médecine, 1880. Appointed, Accoucheur, La Charité, 1882. Nominated, Académie de Médecine, 1889. Organizer, Consultation des nourrissons, 1892. Appointed, chair of Tarnier, Clinique rue d'Assas, 1898. Cofounder, Ligne contre la mortalité infantile, 1902. Author: Le Nourrisson...etc. Paris: Doin, 1900. The first photograph represents the entire body of a 7 month female stillborn with a massive encephalocele. The second photograph is a closeup of the subject's head. The mother was a 24 year-old unmarried primipara. This paper was included in Budin's collection of offprints titled, Obstétrique et gynécologie: recherches cliniques et expérimentales (Paris: Doin, 1886; pp. 237-244). The offprint was illustrated by a woodcut of one of the two photographs (Planche X). Budin is remembered for his well-connected public initiatives to improve prenatal care and to promote the good hygiene and nourishment of newborns. With his mentor, Etienne Stéphane Tarnier, the two men are considered the fathers of perinatology and Budin probably helped Tarnier develop the first incubator (vide intra: Tarnier). Eponyms associated with his name include Budin obstetrical joint—cartilage seen in newborns, situated between the squamous and the two rounded prominences of the occipital bone; and Budin's rule—infants should not consume more than 10% of their body weight in cow's milk per day.